One of the most common training issues that dog guardians deal with are dogs that don’t respond to commands reliably, especially dogs that don’t return when called. There is a way to greatly increase the responsiveness and reliability of a ‘Recall’ and that is to provide your dog with a clear goal and target… your open hand. Teaching your dog that when they hear; “Rover… come”, that their job is to run to you and touch their nose to your hand, greatly clarifies the goal you are setting for them and increases the reliability of their response. With your dog a few feet away, hold a treat between the fingers of your open hand, say your dog’s name and “Come”, wait for the very moment that their nose touches your hand before saying; “Good dog!” and release the treat. 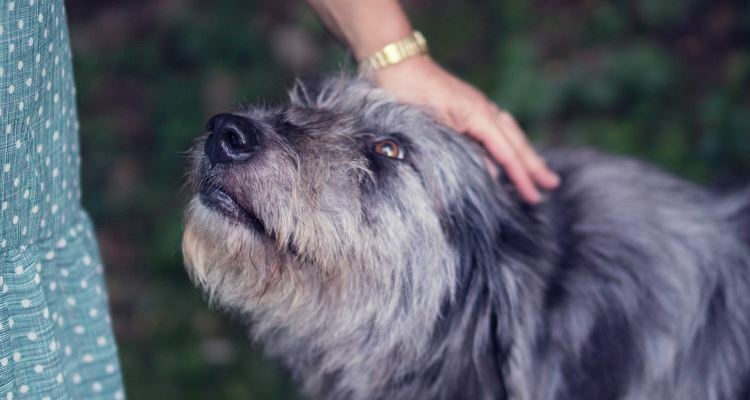 Resist the temptation to move your hand to their nose; your dog must initiate the contact. Don’t praise your dog as encouragement as they approach, you will be praising too soon. Wait for the very moment their nose touches your hand. Once your dog is consistently touching your hand with their nose, begin holding the treat in the opposite hand from your target hand. When your dog touches your open target hand, give lots of praise and offer the treat from your opposite hand. Begin to alternate which hand is the target and which hand holds the treat so that your dog isn’t able to predict which hand holds the treat. Gradually widen the distance between the dog and yourself before you deliver the signal for them to “come”. If they fail too often, back up to a more reliable stage before progressing. Practice this next level of challenge in your home when your dog is out of your sight and in another room. Next you might try a recall in your yard where there are more potential distractions. The plan is to increase the level of potential distractions to challenge your dog’s attentiveness and response time. Yet one more thing to keep in mind (as though I haven’t already given you enough to remember! ), is that your praise can match the quality of response when you call for your dog to come to you. For example; if you say; “Rover… come!” and Rover takes a bit of time to respond and when he does, takes his sweet time about it, stopping to have a sniff at something that captures his nose but in the end did as you asked and touched his nose to your target hand, you should deliver praise but make it very simple praise. Give Rover a simple “Good boy” without petting him. However, if you were to call for Rover while he was surrounded by seven squirrels, a pair of rabbits and five dogs that were sharing a package of bacon strips yet despite this Rover turned on his heels and ran to you with his nose stretched out to your hand – well, Rover deserves an excited “GOOD… BOY! !” some sweet lovin’ from you and a handful of treats. OK… this is a bit of an exaggeration but you get the idea. Dogs are very capable of learning that the better their response the greater the reward. Practice is important for maintenance of any behaviour. Fortunately, the recall is often used on a daily basis. When your dog is off leash and having fun, be careful not to get into the habit of calling them to you and then immediately clipping on their leash and leaving the area they are enjoying. Your dog may soon learn that coming to you when called means the fun is at an end and may avoid returning. When asking your dog to come to you, it is better to vary what happens after they receive praise for successfully coming when you called. You can ask them to do two or three behaviours on their return, such as “sit”, “shake a paw” or “down”. This will put some memory distance between “coming” and the potential negative of leaving the fun area. On occasion you might also call them to return before you need to leave, reward them for returning, and then play with them for a few minutes before leaving. At times during their off-leash fun, call them to you, reward with praise, clip on their leash, ask them to sit, praise them for sitting, then unclip the leash and send them off for another five or ten minutes of fun before you ask them to return again when you need to leave. Another great way to maintain reliability of anything your dog has learned is using “intermittent reinforcement”, whereby a treat is delivered randomly, which keeps your dog guessing as to when a treat is given and helps to maintain the quality of the recall. Make certain a treat is delivered at least one of every three times. If you’ve called to your dog twice and they don’t respond, the best thing to do is to walk half the distance between the two of you, which emphasizes your presence, and try again. Do not use an angry or frustrated tone to your voice. This may only cause your dog hesitancy to return to you. If they still don’t respond your only course is to walk calmly and quietly to them, take hold of their collar, clip on the leash and give them the silent treatment as you leave. Do not scold them as you take hold of your dog. If you do scold your dog, even though they did not respond to your call, your scolding will teach your dog that reconnecting with you can be a negative experience and they may be hesitant to come to you the next time you call. At the same time you cannot be positive about having to go to them and gather your dog so your best response is none at all. Dogs learn by associating your communications with what is happening at the moment. If you have to go and gather your companion and they happen to be with other dogs when you scold, they may think you are punishing them for socializing with other dogs. If you “recall” your dog when you see them doing something you don’t like, do not reprimand them on their return, as you will be reprimanding them for coming when you called. Any undesirable behaviour they were displaying while away from you should be dealt with separately. Have fun and remember the three P’s of teaching your canine companion.